The sign as you enter the village says it all “Welcome to Eddyville Home of Buzzard’s Roost”. Eddyville, NE is a small, quiet community with just under 100 residents. It is nestled in the Wood River Valley between Hwy 40 and Buzzard’s Roost Canyon. Eddyville is surrounded by fertile soil and grass covered hills making the area ideal for farming and raising cattle, which has sustained and provided a home for many families for five plus generations. 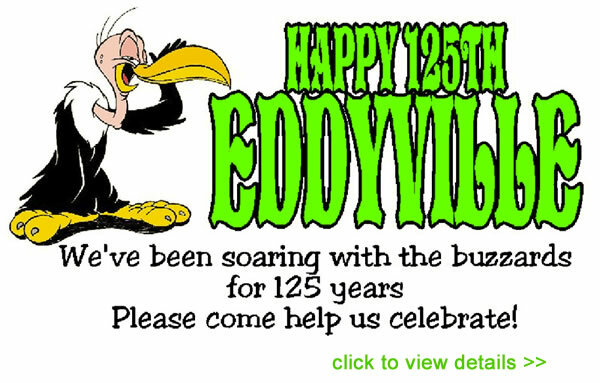 This year marks the Quasquicentennial, 125th anniversary, for Eddyville. As you venture further into the village you will see the American flag flying high over the Legion Park honoring our veterans for their service and dedication. A few more block into town is the Community Building, which is the original school gymnasium and kitchen, where the American Legion and alumni plaques are located. The gym was built by local craftsmen and volunteers completed in 1935. It is a unique structure with its curved ceiling and the stage with its red velvet curtains is still used for a variety of activities including the annual dinner theatre put on by local amateur talent. The dinner theatre is held in March each year and has been a source of great entertainment and homemade meals for 34 consecutive years. Other annual events include a June Rodeo which is in its 48th year. The rodeo is deemed “Nebraska’s Orneriest Rodeo”, with a full line up of events, contestants come from as far as Texas for this event. Trailers line the streets for blocks as the population increases ten-fold for the two nights of performances. The rodeo is put on by the Eddyville Trail Riders, this organization also sponsors the annual spring and fall Buzzard’s Roost Trail Ride. The trail ride meanders through the scenic, historic Buzzard’s Roost Canyon and surrounding area. Wagons are provided for non-riders and is a thrill for young and old. If you watch you will see the Turkey Buzzards for which the canyon is named flying overhead as well as the deer and wild turkeys among other wildlife that call the canyon home. The trail rides are held in May and September. Also in September the Community Building committee and firemen sponsor the annual Mud Drag event. With over 80 entries in a variety of classes, this event is a great time for all. The Mud Drags as well as the Dinner Theatre are major fund raisers for the Community Building. Whether you are just passing through on Hwy 40, touring the beautiful scenery, fishing the nearby South Loup River, hunting abundant deer, turkey, pheasant and quail we invite you to take a minute to stop in Eddyville. You can purchase gas, diesel or get a snack at The Eddyville Pit Stop or enjoy a lunch special or locally raised steaks and hamburgers and a cold beverage at the Busted Knuckle Saloon.